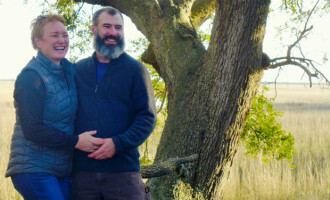 Hanging out with chefs in their kitchens is a favorite pastime. It’s a pleasure to watch them at work and you always pick up the coolest ideas. How does Andre Macias at Tonali get that luscious melting flavor into his pork carnitas? Spoonfuls of fresh lard, my dear. He has a wonderful way of flipping the pork in a sauté pan over a high flame to brown it. When he plates the carnitas, he tops them with pickled red onion—a great contrast with the rich meat. 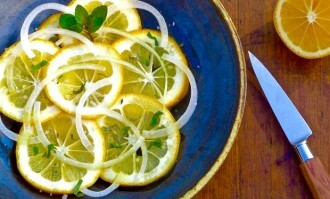 The sweetly fragrant rind of organic Meyer lemons, preserved in salt, brightens late winter stews and tagines. It also adds spark to an early spring risotto with herbs. Preserved lemons take just 10 minutes to prepare, but you’ll have to wait at least a week to use them. And here’s another thing that makes me smile: A jar of preserved Meyer lemons, glowing like the sun, inside a shiny white refrigerator. Actually make that two jars, one with spices, and one without. 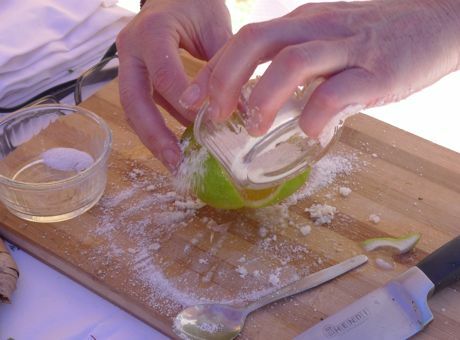 The last days of winter are a good time to make preserved lemons at home. Organic Meyer lemons are abundant, at least in the markets, and their salt-cured peel adds a spark of intensity to early spring dishes such as risotto or pasta with parsley and other fresh herbs. On nippy March evenings, you can also use salty preserved lemons to brighten the comforting stews and savory Moroccan tagines that our chilled bodies still crave. Even better, make a slow-roasted tomato paste with preserved lemon, cinnamon and white pepper, then serve as a condiment with braised lamb shanks or smoky pork chops. The sun-struck flavors send a cheery message: Summer is coming soon. 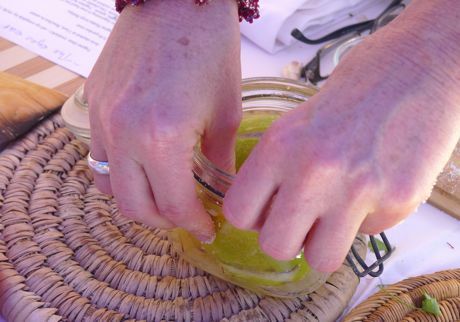 One hot day in Marrakech, lollygagging under a white tent that sheltered us from the scorching sun, I watched Peggy Markel demonstrate the traditional Moroccan way of making preserved lemons. The soft, salted rind is a key ingredient for adding zest—no pun intended—to savory tagines. The most classic is chicken with olives and coriander, but the lemony slivers are also delicious with fish, lamb and vegetable dishes. Of course there are other ways of using preserved lemon, even in Morocco. I’m especially intrigued by the idea—introduced by Paula Wolfert in Couscous and Other Good Food from Morocco—of replacing fresh oranges with preserved lemons in a popular salad that also includes black olives, garlic and parsley. 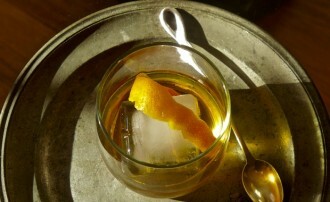 To do so would dramatically transform a sweet citrus dish into one with more aggressive—and certainly saltier—flavors. To make preserved lemons the traditional way, you’ll need a clean glass jar with a tight fitting lid, (preferably with a rubber or plastic sealing ring), 6 to 8 small organic or Meyer lemons and a lot of sea salt. And you’ll need time: Making them is a snap, but they’ll take three weeks to cure. First scrub the lemons well and dry them. Next quarter each lemon, slicing down from the top, leaving the wedges attached at the bottom end. Do not cut all the way through. Stuff at least one tablespoon of salt into each quadrant. Put the lemon into the preserving jar. Repeat with as many lemons as you need to fill the jar, packing them firmly as you go. “Leave them on the kitchen counter for 3 weeks,” Peggy advised. “Turn them upside down, then right side up every day.” (Inverting the jar distributes the salt and the juices evenly.) According to Peggy, lemons made this way will keep for up to one year in the pantry or refrigerator. As much as I love slow food, I was instantly seduced by Wolfert’s 7-day method, which you can find in her book, World of Food (a.k.a. Mediterranean Food). The problem is that I’m always forgetting to check on my lemon supply, so I wind up with a mostly empty jar just when I’m longing to make a dish that requires lots of preserved peel. 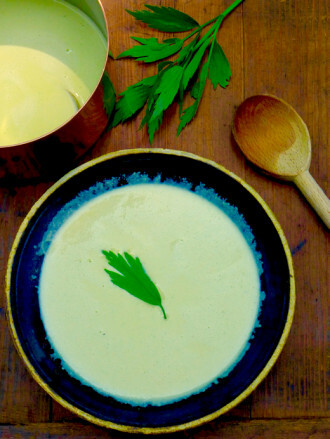 Three weeks is a long time to wait, so her “quick” recipe is a cheater’s dream. Rather than relying on the salt alone to slowly draw out the lemon juice and soften the peel, Wolfert jumpstarts the process by adding plenty of freshly squeezed juice to the jar at the beginning. This speeds up the preserving process so that the lemons “cure” in one week. They can be used immediately or stored in the refrigerator. 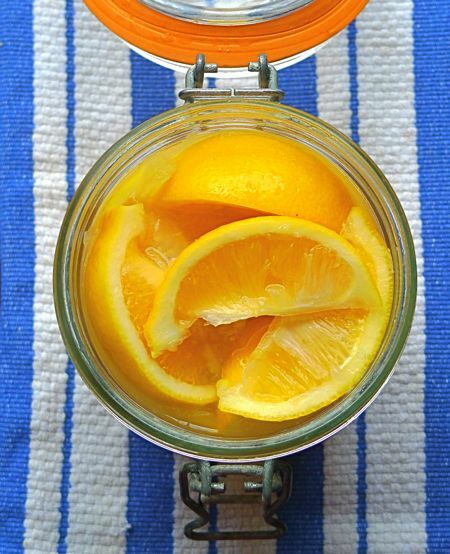 Here’s Wolfert’s method: For an 8-ounce jar, wash and dry two large organic Meyer lemons. Stand one lemon on end and cut it in quarters vertically. Then cut each quarter in half. You will have eight separate wedges. Repeat with the other lemon and place all the wedges in a bowl. Toss with 1/3 cup kosher or sea salt and pack them firmly into the jar. Sprinkle any salt that remains in the bowl over the lemons. Pour ½ cup freshly squeezed lemon juice into the jar, close it and shake well. Place the lemons on the kitchen counter—I keep mine on a ledge over the sink—where you will see them every day. (Very pretty!) Like Wolfert, I shake the jar each morning, but then I also invert it and let it sit that way for 24 hours. The tips of the lemons are never quite covered by the juice, so by turning the jar upside down every other day, they’ll be submerged at least part of the time. This only works if you have a very tight fitting lid with a rubber seal. After seven days, open the jar and inhale the briny citrus aroma. Cover the lemons with extra virgin olive oil, replace the lid, and refrigerate. You could probably keep them in the refrigerator for up to 6 months, though mine never last that long. Whichever method you choose, it’s fun to make one jar of plain preserved lemons and another with spices. You can stick cloves into a few of the wedges, add a 1-inch piece of true cinnamon—already slightly citrusy in flavor—to the jar, or experiment with licorice-scented star anise or a teaspoon of lightly crushed fennel seeds. 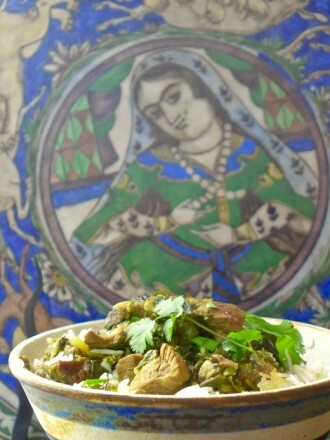 Peggy suggests adding cardamom or a pinch of saffron, a spice which often finds its way into tagines. But don’t go overboard. The idea is to add just a bit of extra flavor. Since the flesh is intensely salty, usually only the rind of the preserved lemon is used in cooking. Whenever you need it, remove one or two wedges and discard the flesh. 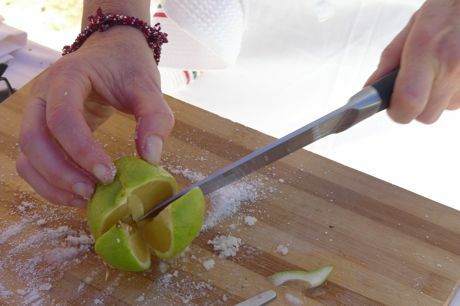 Rinse the rind and dry it; then, using a sharp paring knife, cut it into thin strips or fine dice. There are lots of ways to use preserved lemons that don’t involve Moroccan cooking. You can stir the peel into risotto or pasta with herbs, toss it with sautéed shrimp, black olives and tomatoes, even sprinkle it over tabouleh with parsley and walnuts. You can make the roasted tomato, cinnamon and preserved lemon paste, then use it as a sandwich spread or as a condiment for grilled meats. Peggy suggests slathering crusty bread with a rich, savory paste made of preserved lemon, ricotta and cilantro. Can’t you just taste the sunshine?